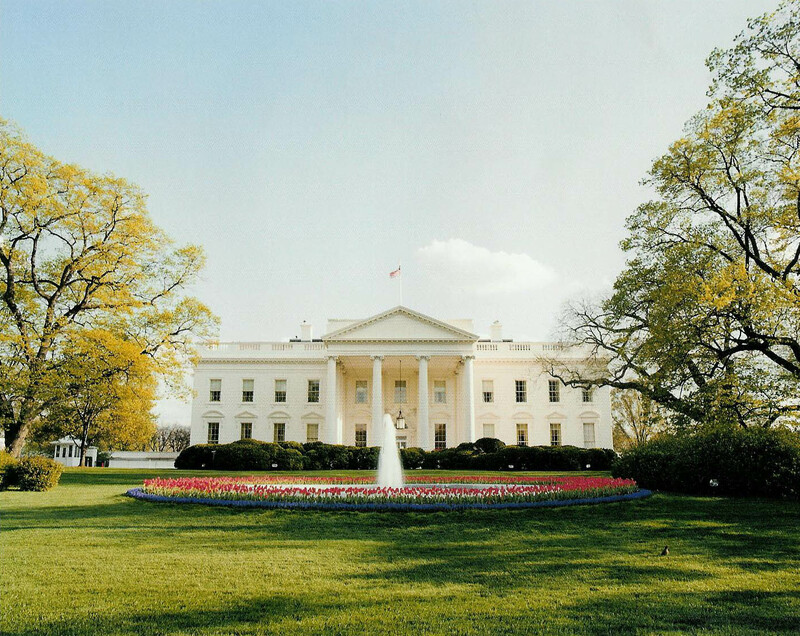 Photo of the White House. Mrs. Schleden’s second grade class at Turtle Creek Elementary School recently wrote letters to President Obama after he won his second term this November. The students were excited to learn about the country’s election process in social studies, and letter writing in English class. The students were able to ask President Obama some questions and they also told him a few things about themselves. Some questions were about his family, pets, and the difficulty of his job. When the class returned after winter break, a wonderful surprise awaited them. There was a large manilla envelope from The White House. It was a very exciting moment when they opened the letter from the president, drafted on official White House stationary. (The embossed seal at the top did not “scan” for digital reproduction). He enclosed some pictures of both the inside and outside of the White House, pictures of himself and his dog Bo. 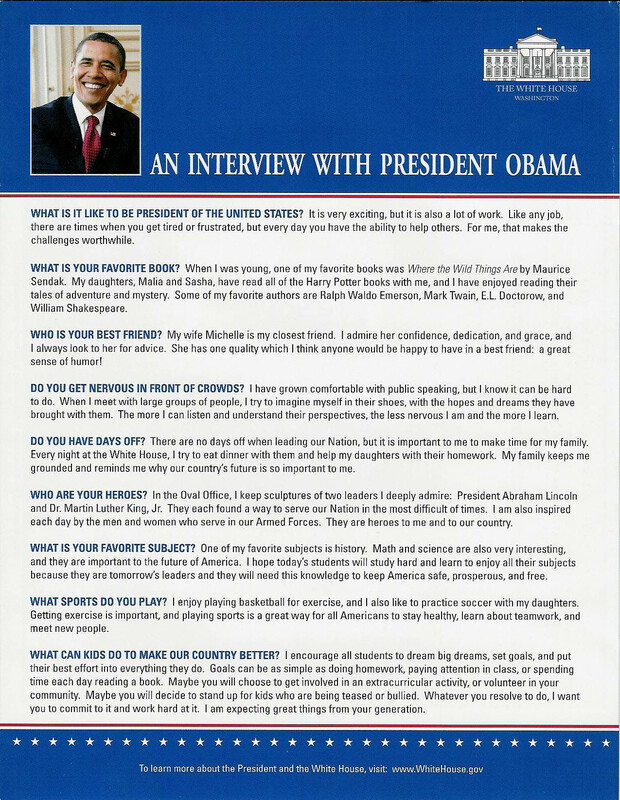 There was also a written interview with President Obama and in this interview were the answers to many of the students’ questions. 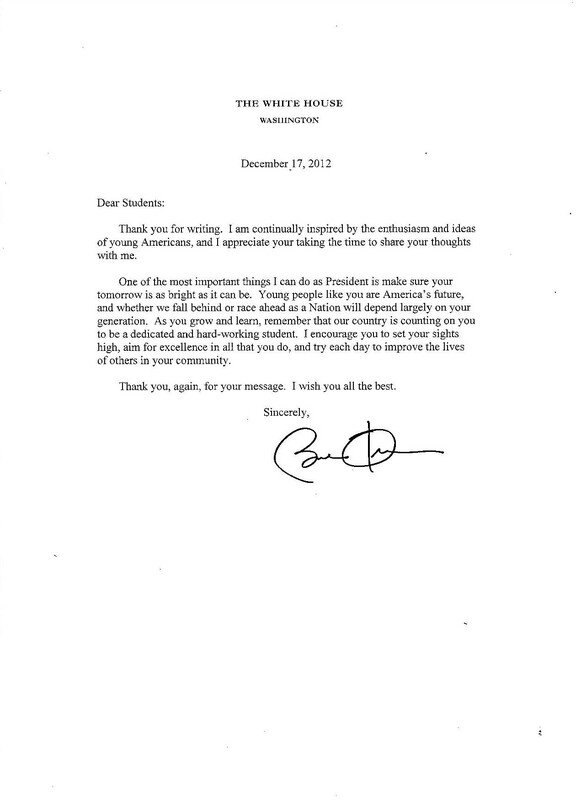 You can read the letter to the class by clicking the link above. All-in-all, it was a wonderful learning experience for the second graders in Mrs. Schleden’s class. This entry was posted in Delavan-Darien School District, Turtle Creek Elementary School. Bookmark the permalink. Click here to learn about buying photos from our galleries. All comments in this blog are moderated. Comments that are solicitations, obscene, vulgar, sexually oriented, racist, sexist, harassing, degrading, libelous, threatening or harmful will not be posted. We reserve the right to deny or remove any comments that we deem inappropriate. We encourage comments that are related to the post and questions to be asked. If you notice a factual error, e-mail mheine@ddschools.org.